Have a relaxed feel and fit whether you're lounging inside, hitting the streets or off to training. 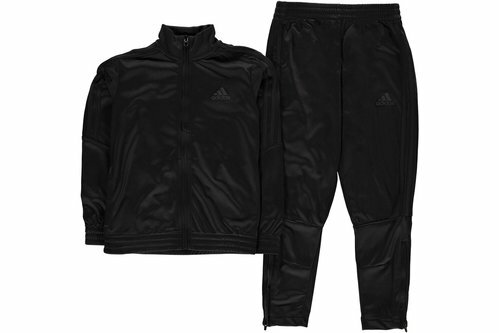 Stay comfortable in this adidas Tiro Poly Tracksuit Junior in Triple Black. 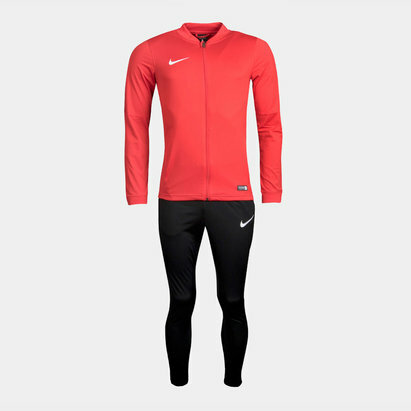 The adidas Tiro Poly Mens Tracksuit is a two piece which includes a jacket and pants. The jacket has a full zip with an elasticated waistband and wrist cuffs with the adidas 3 stripes running down the arms while the logo is printed on the front. The jacket like the bottoms has two open pockets. The tracksuit bottoms have an elasticated waist with adjustable inner drawcord for a secure and comfortable fit and zip expanders to the ankles, complete with the classic adidas branding. Delivery takes 3-5 working days and will be shipped via Hermes. This is a flat charge for an unlimited number of items. (£8.99 for highlands/islands) Order and receive your order the next working day. Have your items delivered to a Collect+ store near you. To see postage options for your destination please choose your shipping country at the top of the page. If for any reason you are not satisfied with your purchase from Lovell Rugby, you may return the product(s) to us within 28 days of the purchase date for a refund or exchange. Free exchanges (UK only) - We will then re-send the replacement item(s) back to you on standard delivery service at no extra cost. Collect+ Returns - With over 7,000 stores nationwide Collect+ is the simple and easy way to return your parcel. Last few selling fast - order quickly! This product must be personalised. This product cannot be personalised. Sign up to our mailing list.